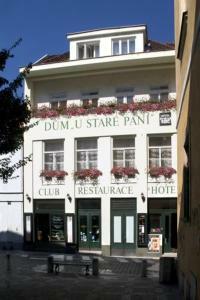 Occupying a historic building from the 15th century, the U Stare Pani - At the Old Lady Hotel is located in a pedestrian zone in the centre of Prague. It offers free WiFi access. The spacious rooms at the Old Lady Hotel feature satellite TV, a minibar, and a hairdryer. Czech and international dishes are served at the restaurant. At The Old Lady Hotel also features a well-known music club hosting leading performers of jazz, rock, pop, funk, Latin and alternative music. It is accessible free of charge for hotel guests.